Kmart Corporation headquarters, Troy, Michigan. Kmart began as one of the first discount stores. They were also called "five-and-dimes" because each item in the store could be purchased for five or ten cents. Soon after it opened, because of good management and fair prices, Kmart became the top discount retailer in the United States. It was even more successful than Woolworth, the company that introduced the idea of variety discount stores. Eventually the success of Kmart caused the decline and the closing of Woolworth stores. The story then repeated itself. Kmart became the leader of discount stores, but because of poor management and overspending, new discount stores on the block, including Wal-Mart and Target (see entries), began to take over, leaving Kmart with too many stores, too few customers, and not enough money to stay in business. The fate of the historic retailer, however, has yet to be determined. Plans to close unprofitable stores and revitalize older ones are the company's latest efforts to restore Kmart's fading image. S. S. Kresge understood the value of a dollar. He worked hard for his money and spent it carefully. While working as a bookkeeper in a hardware store in 1889, Kresge noticed that customers who purchased store merchandise on credit, rather than paying cash, bought a lot of items without thinking because they were not handing over their hard-earned dollars right at the time of the sale. Kresge also believed that allowing customers to buy on credit caused the store to lose money because products went out but cash did not come in. He was impressed by the way the new discount stores did business. Frank W. Woolworth (1852-1919) was the founder of the first "Great 5-Cent Store" and John McCrory (1860-1943) later established McCrory discount stores. At both businesses, customers had to pay cash for their purchases. According to Kresge, this would make customers spend their money more wisely. Kresge wanted to go into business with Woolworth, but Woolworth turned him down. Instead, he joined McCrory, who had a chain of six "bazaar" stores and two five-and-ten cent stores. In 1897, Kresge gave McCrory $8,000 and became an equal partner in his business. They opened stores in Memphis, Tennessee, and Detroit, Michigan. Two years later, Kresge became sole manager of the Detroit store and eventually paid McCrory $3,000 to end their partnership and give up his share of the Memphis store. Soon Kresge found another partner, his brother-in-law Charles J. Wilson. He also established his headquarters in Detroit. From 1900 to 1907 the partners opened stores in eight cities: Detroit; Port Huron, Michigan; Toledo, Ohio; Cleveland, Ohio; Columbus, Ohio; Pittsburgh, Pennsylvania; Indianapolis, Indiana; and Chicago, Illinois. By 1912 Kresge bought out Wilson, changed the company's name to S. S. Kresge, and expanded to eighty-five stores with annual sales of $10 million. Second only to Woolworth dime stores, Kresge's had become a household name for cost-conscious shoppers throughout the Midwest and Northeast. S. S. Kresge establishes S. S. Kresge Company. Kresge has eighty-five stores and $10 million in sales. First Kmart store opens in suburb of Detroit, Michigan. S. S. Kresge dies; sales top the $1 billion mark. Kresge name changes to Kmart Corporation. Kmart acquires Walden Book Company and Builders Square. Martha Stewart is introduced as Kmart's entertainment and lifestyle spokesperson and consultant. Company purchases Sports Authority and acquires OfficeMax. The new Big Kmart format and logo is launched. The Blue Light Special is reintroduced. Kmart files for Chapter 11 bankruptcy protection; company undergoes management reorganization. After World War I (1914-18), inflation caused prices everywhere to rise quickly, which made it difficult for dime stores to maintain their low prices. To stay in business, Kresge opened "green front" stores, selling items for twenty-five cents to one dollar, next to the traditional five-and ten-cent "red front" stores. Kresge's and Woolworth's, which also had red and green front stores, were most often located in high-traffic downtown areas. This was before suburban areas were developed in areas surrounding larger cities. By the mid-1930s, Kresge opened his first store in a suburban shopping center in Kansas City, Missouri, eventually selling items for hundreds of dollars. By the 1950s, five-and-dime stores had become known as variety stores because they sold a variety of items at low prices. Kresge's was one of many variety stores, and competition was fierce. In 1959, a thirty-year Kresge employee, Harry B. Cunningham (1907-1992), was promoted to company president. Under his leadership the company made some changes that would eventually make it the number one discount store. Cunningham researched other discount stores and visited all of the Kresge stores. He determined the company would make more money if it purchased large amounts of a small number of items and discounted their prices. With this innovation, the Kresge company invested $80 million to build a chain of discount stores. The chain was called Kmart, and in 1962, the first store opened in Garden City, Michigan, a suburb of Detroit. The 1960s and 1970s were times of great expansion. In 1966, the year Sebastian Kresge died, S. S. Kresge Corporation owned 162 Kmart stores, 753 Kresge stores, 100 Jupiter stores (Kresge stores located in deteriorating business areas that were renamed "Jupiter"), and 108 Canadian stores. 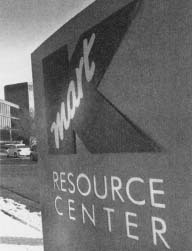 In 1977, because the Kmart stores provided more than 90 percent of Kresge sales, the company changed its name to the Kmart Corporation. A customer went to a five-and-dime store to purchase all sorts of items contained under one roof. Adults might find purses, animal soap, shaving brushes, or police whistles. Children could purchase supplies like pencils, tablets of paper, a box of sixteen crayons, white paste, boy's ties, girl's hair ribbons, and pocket combs—all for ten cents or less. Dime stores were also popular for their lunch counters where customers could sit on stools at a counter and enjoy lunch, drinks, and sweets for twenty-five cents or less. In 1899, the typical wage earned by a five-and-dime counter girl was $2.50 to $3.00 per week. 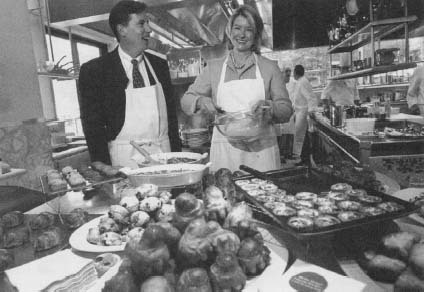 Former Kmart CEO Chuck Conaway talks with Martha Stewart at the October 2000 debut of Martha Stewart Everyday Kitchen, an extensive line of housewares available only at Kmart. computer system and improved the way it distributed its merchandise. In another effort to boost the company's income, Kmart Corporation began to expand by purchasing other companies. From 1984 to 1992, Kmart acquired Walden Book Company, Builders Square (a chain of home improvement stores), Payless Drugs Northwest, PACE Membership Warehouse, The Sports Authority, OfficeMax, and Borders bookstores. In addition, they introduced Designer Depot stores, which specialized in off-price apparel, or brand-named merchandise reduced to very low prices. In 1987, the company began one of the most important associations in its history: introducing Martha Stewart (see Martha Stewart Living Omnimedia, Inc. entry) as Kmart's entertainment and lifestyle spokesperson and consultant. Even with the help of Martha Stewart and her products, Kmart continually fell behind its competitors. Wal-Mart had become the nation's number one retailer in January 1991. 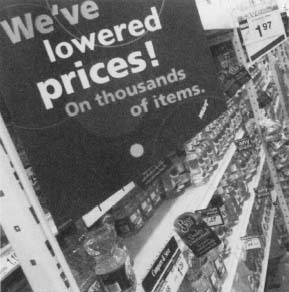 Throughout the 1990s and into 2000, Kmart tried to win back old customers and attract new ones. In 1991, it opened Kmart Supercenters, which carried both groceries and general merchandise and was open twenty-four hours, seven days a week. In 1997, the company introduced a new Big Kmart store format and logo for renovated and updated stores, and in 1999, BlueLight.com was launched, which provided free Internet access. In order to make enough money to complete all of the renovations, Kmart had to sell the retail chains that it had purchased earlier in the decade like Borders, OfficeMax, and Builders Squares. The company also tried new advertising campaigns, including chatty television commercials featuring popular comedian and talk-show host Rosie O'Donnell (1962-) and director Penny Marshall (1943-). In the spring of 1998 it looked like Kmart might be revived. The company reported earnings of $47 million, which was triple the amount that had been reported in 1997. According to financial analysts, however, the growth was partially due to the strength of the consumer economy. Kmart still had a long way to go to surpass its competitors and resume its number one position. Kmart will always be recognized as the home of the Blue Light Special, an in-store advertising campaign where a flashing blue light, accompanied by the announcement "Attention, Kmart shoppers…," alerted customers about a spontaneous sale. This technique was copied from the blue plate special in 1940s restaurants. After the period of expansion and growth ended, Kmart needed a new plan for survival. In 2000, they recruited Charles Conaway, an executive from drugstore chain CVS, to help with reorganization. "Kmart has been in need of some new blood, and I think this is a step in the right direction," financial analyst Jeffrey Edelman said in a 2000 New York Times article. One of the ways Conaway tried to compete with Wal-Mart was to reintroduce the "Blue Light Special" in 2001, ten years after it was discontinued. This time it was promoted as the "Blue Light Always" campaign, with disco-dancing blue lights and $25 million worth of ads saying that prices had been cut on thirty-eight thousand items. Prices for almost all items, however, were still lower at Wal-Mart. The campaign failed, and Kmart was in worse shape than ever. By January 2002, customers were complaining. They claimed that advertised items were not always in stock, Kmart stores were messy, Wal-Mart had better prices, and Target offered more stylish options. The company had lost so much money that Kmart decided to file for Chapter 11 bankruptcy protection. Filing Chapter 11 bankruptcy gives the company time to form a business plan to get back up on its feet. Part of Kmart's plan involved closing its most unprofitable stores, which included over two hundred Kmart discount stores and twelve Kmart Supercenter retail outlets in forty states, and one Kmart store in Puerto Rico. In 1987, when Martha Stewart joined Kmart as the company's spokesperson, the store was the nation's biggest discount chain with sales of $23.99 billion. Ten years later, Kmart introduced Martha's Everyday Collection. A 1997 Time article reported that the collection offered "Kmart's shoppers (median income: $35,000) the kind of items that Martha might buy, at an affordable price." The collection consisted of bed and bath fashions and a 256-color paint line. Later, the collection expanded to include such items as garden tools, patio furniture, live plants and seeds, houseware essentials, storage helpers and organizers, and home decorating products. The relationship between Stewart and Kmart became strained after the company filed for bankruptcy in 2002. The celebrity and the discount retailer agreed, however, that as long as Kmart was able to pay Stewart's company for the products it sold, Stewart's contract would extend until 2008. To show her support and boost sales, Stewart appeared in a TV commercial directed by Spike Lee (1957-). The "Stuff of Life" ad, which aired in May 2002, promoted Stewart's Everyday product line and urged viewers to go to Kmart. A few months later, Kmart reported a $2.4 billion loss from the previous year and an additional $1 billion loss for a five-week period ending May 1, 2002. "The challenge is tougher than ever," said Keith Naughton, author of a 2002 Newsweek article, "now that Kmart's identity crisis … has morphed into a financial crisis." But troubles only got worse. In May, the FBI announced that it was investigating the company for "possible criminal violations." Many of Kmart's former management team were also being investigated. Discount shoppers navigate the newly renovated aisles of the brighter Super Kmart store. That same month CEO Charles Conaway was replaced by James B. Adamson, and as of June 2002, the company continued to undergo reorganization. Adamson and other Kmart executives remained hopeful and projected a revival for the company by spring 2004. According to Adamson in Supermarket News, "While there is still much hard work ahead, we are pleased with the progress we are making in addressing in-stock levels, customer service and store traffic." Kellogg, W. K. Kresge, S. S.